1. When to dig – as early as possible, or leave for later? It is better to start with a pond creation as early as possible. Because when you create a pond with heavy equipment perceptive, turning, all the plants are of 15-20 meters around the pond, treaded down part of the border (hedge), passing through it and falling asleep of the border when creating the mound (if the land is sloping). When we dug the pond, we had to demolish part of the fence and replant the part of the hedge. Large, grown-up plants are very difficult to transplant, and the probability that they will survive in the new place – minimal. 2. 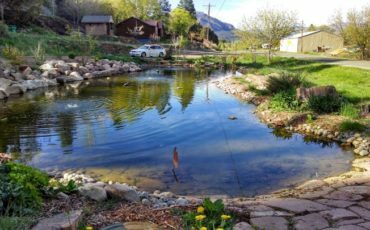 The choice of location for a pond on the homestead. As surface spring creeks and underground springs (groundwater) drain into the low spot, to a pond filled with water, we decided to dig it up at the lowest point of the site. We have inclined area, because it is on the edge of the field at the ravine. 3. Dig by hand or with an excavator? I dug a well with an excavator – depth of 5 meters and a rectangular hole 3 to 5 meters, 2 meters depth, I know this is very hard. I saw “the ponds” from the neighbors plots that they dug by hand – this is not the ponds, this is small holes without water. 4. The choice of the size and shape of the pond. You need to consider that the ditch will be filled with water partly. The water will be below the edge of the pit 1…4 meters (high in the spring and low in late summer). The depth of the pit should be 1…4 meters more than the desired depth of water. Dimensions of the pit should be 2-3 times larger (wider) than the size of the mirror of water. The inclination of the walls should be not steeper than 1 to 2 – 1 vertical, 2 horizontal (27°). In the spring, when the ground is saturated with moisture, the vertical wall of the gutter to approximately the bend. The pond should be done immediately. Dig and increase the pond after – much more difficult and expensive. 5. The calculation of the indicative prices. How much money will you need? The cost of the pond depends on the size. The pond size is 1000 cubic meters. The size of the pit 17 to 30 m, 5m depth. 6. The process of pond creation. The topsoil must be removed to clay, especially under an embankment or dam, otherwise it will leak water. So the bowl of the pit must be entirely of clay – without layers of fertile soil. Waterproofing with shaking clay or smearing with clay we haven’t done. At the last stage, the fertile layer is applied to the edge of the pit to grow grass. We have worked crawler excavator (its shipping with us is included in the total price), two dump trucks carted the excavated soil. All the excavated soil went the bulk dam. At the last stage drove crawler bulldozer for compaction of the dam and leveling. We dug about 4 days (shovel broke down, it’s being repaired). 7. Once the pond was filled with groundwater. A month later we were swimming in pond. We’ve planted grass, to walk barefoot (bentgrass and dwarf types). 8. The bridge and stairs. Water is a transparent, bluish. To enter the slippery sticky clay is impossible. We made a bridge and stairs to enter and exit without stepping on the bottom. 9. Soon in the pond were themselves aquatic plants, dragonflies, beetles floaters, etc. Plan to launch in the pond fish. To establish the minimum size a pond where we can swim, you need about 200 thousand roubles to excavate 1000 cubic meters. The pond should be done immediately. Digging and increasing a pond then much more difficult and expensive. His plot is flat (horizontal), pit is not deep (3-meter). The water in the pond closer to the surface of the earth than us. But it is muddy (clay). It seems that the particles of clay smaller – not settle, but they hold water better. On the photo – the end of summer, the water is about 1.5 meters depth. What I did to be able to swim: mow algae from the pond, pulled them on ashore. If algae are not removed from the water, they will rot and emit a stench (tested). Pumped water from the well. The algae are cut off very easily. Murk has settled – you can swim.